Es gibt dort bestimmt wieder tolle Ideen zu sehen! Ich finde die Karte auch absolut klasse! Ist der Dressurreiter tatsächlich ein Stempel? Wenn ja, woher??? Danke dir! Das Pferd habe ich ausgestanzt, mit einer Stanz-Schablone von "joycrafts". Love it! A great CAS design. Thanks for playing at Global Design Project with us this week. Thank you, Paula! Comments of the team always make my day! Love this stamp - where's it from? Dear Fiona! The horse is not a stamp, it is a cutting stencil (joycrafts). "You 're a star" is a stamp (Stampin up: Pictogram Punches). What a fun card! The image pairs perfectly with the plaid paper on the outsides. Thank you so much for playing along with this week's Global Design Project sketch challenge! Such a cute card. I love the gingham Designer Series Paper, it matches the image so well. 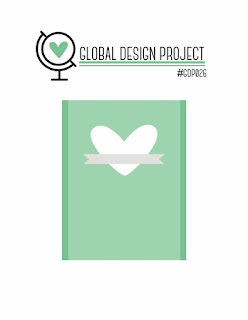 Thanks for playing with Global Design Project.